DAVIDIAN was grounded in the Summer of 1997 by guitarists Alex Schniepp and Micha Weidler. Gradually, out of a short-lived cover band, developed an original Thrash Metal style. The new line-up played gigs constantly in the southern Germany region. After developing several years of stage experience and with new material in hand, DAVIDIAN entered the studio in the summer of 2003 to record their first full-length album, “Abuse of Power,” (self-produced) at Lederfabrik-Studio in Pforzheim. 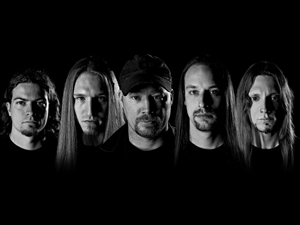 The debut album won praise from the national and international press for its technical and aggressive thrash metal combination accompanied by bold and intelligent lyrics. DAVIDIAN followed then with gigs all over Germany and in bordering countries, developing a growing popularity in the European metal scene. Through this success, the band was then booked for several large festivals: UpFromTheGround, Kaltenbach Open Air, Hard Taste, Metallic Noise Festival and ZABBADUSCHDER Open Air (which is organized by DAVIDIAN). A setback came in the Fall of 2004 when the shouter had to leave the band due to family and work reasons, while continuing to play all planned gigs. Not until the beginning of 2006, after endless advertisements and auditions, was the position as vocalist filled by the American Dave Hopkins. Through 2006, DAVIDIAN then worked on new material, and then decided to reenter the studio to record a new album. In February of 2007, DAVIDIAN entered the renowned Stage One Studio near Kassel, and together with producer Andy Classen created the new modern ThrashCore album. The powerful and at once transparent sound on “Hear Their Cries” demonstrates the musical potential of the band as well as the powerful range of the singer. In November 2007 a deal was then signed with Limited Access Records to bring out “Hear Their Cries” in 2008.